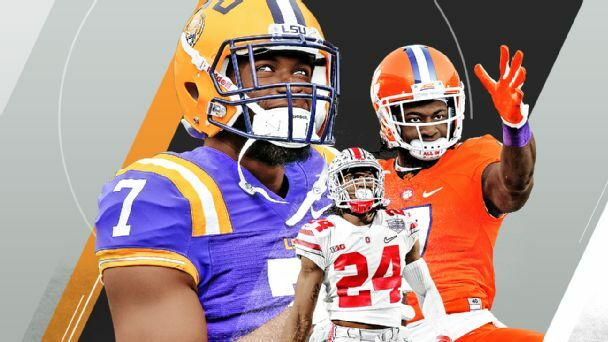 McShay's 2017 NFL Mock Draft 3.0: How high will McCaffrey go? With the NFL combine behind us, pro days and individual workouts are next up on the schedule for teams evaluating players for the 2017 NFL draft. We made some updates to our board after seeing the measurements and athletic testing results from most of the top prospects in Indianapolis, and we continue to adjust players' grades as we complete their tape evaluations. We also came away from Indianapolis with some more ideas on the direction teams could go with their picks. Here is my third projection of the 32 first-round picks in the draft. An important note: I'm a big fan of CB Sidney Jones, but he's not included in this mock draft after suffering what looks to be a serious leg injury at Washington's pro day last week. Some team will get a steal on Day 2 if Jones returns to full health. The Browns shouldn't overthink this: Garrett is the best pure pass-rusher -- and one of the best overall athletes -- in the draft. His freakish combine numbers (4.64 40-yard dash and a 41-inch vertical at 272 pounds) cemented his status as the No. 1 overall pick, in my opinion. Garrett can fit into any scheme. He's a transcendent-type player.